Welcome to the six hundred and thirtieth of my blog interviews with novelists, poets, short story authors, biographers, agents, publishers and more. 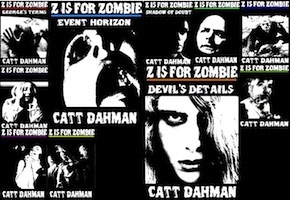 Today’s is with horror and western author catt dahman. A list of interviewees (blogged and scheduled) can be found here. If you like what you read, please do go and investigate further. catt: I am catt dahman (no capitals) because when I am the WRITER (as opposed to mom and wife etc.) I am in the zone. I have a persona for myself since what I write is often very brutal and gory. I pull no punches and I have to have a mind set to be that way. I have lived all over the US but am in Fort Worth, Texas now. I was born a Texan. I began writing because I had to write speeches for competitions in junior high. So, I started as a speech writer. Morgen: I’ve introduced you as a horror and western author, what genre do you generally write and have you considered other genres? 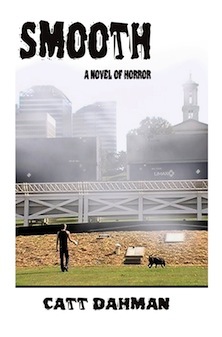 catt: I write horror: splatterpunk, psychological, apocalyptic, and general horror. I kind of specialize in writing about people who are lonely or alone. I do write westerns and plan to write some western apocalyptic novels as well. Everyone wants mysteries and I just find them as confusing as reading Greek. Morgen: I’ve never read Greek but love mysteries (although in my teens I read every Stephen King available) so maybe I should. 🙂 What have you had published to-date? 1 picture book: Limmy the Zombie Killer which is a kitten killing zeds in pictures and some writing… very funny pictures of my kitten dressed in GI Joe equipment. Morgen: Sweet. Sounds like the sort of thing that goes up online and goes ‘viral’. Are your books available as eBooks? How involved were you in that process? Do you read eBooks or is it paper all the way? catt: I am all about e-books. I got my Kindle Fire and was addicted fast since my bookshelves are all overloaded. I like reading in the dark; I can see on a Kindle. I released my books as e-books after being a paper author back in the 1980s. The Time of Grace is much better in sales as an e-book than it was on paper. Morgen: Most authors are finding that (I’m eBook only so far so I have no comparison), probably because they’re accessible instantly, usually much cheaper – it does make me angry when I see, usually mainstream, books being charged a similar amount to their hard copy equivalents – and they, as you say, don’t take up any extra physical space. Do you have a favourite of your books or characters? If any of your books were made into films, who would you have as the leading actor/s? 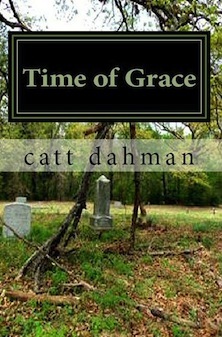 catt: I love my “Time of Grace” because of the subject… 1957 in east Texas. And I love my Westerns because the fictional characters hang out with Doc Holiday and all and I had such a great time out in Arizona researching it and hanging out with the actors from the movie “Tombstone”. I also love the zombie series because it’s just so much fun. In every book I write, there is always a role for Ed Harris because he is an actor who is just so big on screen. I am a big fan of Richard Laymon and from him, I learned to just tell the story without apologies. I like Stephen King and from him, I learned to have strong characters. Thomas Tryon and Ira Levin are also favourites. If I got to pick actors for my books, I would write a book with characters especially for Ed Harris, Gary Sinese and David Morse who I think are the greatest. Morgen: In my teens I was hooked on Stephen King (even to the point of reading under the covers late at night with a torch) but have ‘mellowed’ since to crime. I’ve not read any Richard Laymon but do see his books around. Did you have any say in the titles / covers of your books? How important do you think they are? catt: I have 100 % control over titles and covers and refuse to ever have less. 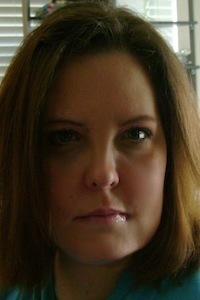 catt: I am working on the zombie series and more horror… pretty hard-core horror with psychological twists and turns. I never pull punches… I am always brutal. Morgen: Late last year I started writing a new (first) crime series and it had some pretty grim scenes in it, although I suspect less than yours! Do you manage to write every day? Do you ever suffer from writer’s block? catt: I write everyday, 5-18 hours a day, seven days a week. I almost need a block because I have more ideas flowing than I have time to write it all! Morgen: Me too but wow, that’s good going. Do you plot your stories or do you just get an idea and run with it? catt: I start with a “What if………….” and start writing. As I develop characters, I take notes but the endings are sometimes there and sometimes a surprise to me. The middle is always surprising and I let the story go wherever it needs to go and I follow my characters and I am prone to saying, “I never saw THAT coming.” even as I type it. When I try to plan, it feels stilted and my imagination just stalls. It’s better for me to let it pan out as it will and however it ends…it ends…but it always seems fair (if not happy) in the end. Morgen: Hopefully if you ‘never saw that coming’ then nor will your readers. As soon as we bore of something then there’s a good chance they will. Do you have a method for creating your characters, their names and what do you think makes them believable? catt: Sometimes a character is memorable for being just very plain and non-memorable. I like the take the ones who are plain, nothing special, not stand outs, and put them in a great situation and let them figure out what to do… good or bad…. and it works. “The Green River Killer”, to me is a perfect character because the man was just so ordinary. When the boogie man is a monster with dripping fangs and horns… well… you expect it… but when the boogie man is the nice lady next door who bakes cookies and rescues cats… wow…. you can really play with that! The whole story takes on a new life with ordinary people as the villains or heroes. I think we can relate and sat ‘that could be me.” when we don’t over-do the characters. Morgen: Absolutely. That’s how they should be. As you say, make something too predictable and it’s, well, predictable, unless you twist it, of course. With all the writing you do, do you do a lot of editing or do you find that as time goes on your writing is more fully-formed? catt: I do little editing and never have had to do much. I let it flow and am generally happier when I do so. If I edit and work at things, I always pick them to death and ruin them. I have one I edited heavily and it has now sat for years because I lost the original thrust of it… it got way too tame and nice for a horror novel. Morgen: But you’ve since had more writing experience so you could untame it, or release it as another genre? You mentioned researching in Arizona. Do you have to do much research generally? catt: A fair amount… scientific…. and some historical… and I researched curse words in other languages… lol… sometimes the research is just so I feel the flavour of the time… like Vietnam… I have to get the feelings down solid. I do have a firearms expert that I turn to a lot. I did a ton of research for my westerns: two years’ worth. Morgen: Isn’t it great having someone you can rely on to give you accurate information. The joy of having interviewed so many people is that I can turn to some of them for advice (and I have). What’s your favourite / least favourite aspect of your writing life? Has anything surprised you? catt: What shocks me is when a reviewer suggests this deep underlying message in my writing and I have to stop and think about it. I can see the same when I look, but when I am writing, I often don’t plan a deep message. I have been told my writing is “fair” in that I don’t rely on tricks and formulas, but write in a fair, realistic way. My favourite part is when someone says (about a character) “That is so me.” I feel as if I have gotten to the heart. Morgen: It’s amazing what happens in our subconscious. That’s what I love about fiction; you never know what’s going to come out, and readers often interpret differently to what the author intended (for better or worse). What advice would you give aspiring writers? Find your voice. Writers without a voice drive me insane. Now I can write in other voices, sure, but in most of my works, you hear my easy-going east Texas voice that just tells it like it is. There is nothing worse than a writer trying to use another voice by adding big words and off phrases. Several writers always use their own voices: Stephen King, Dean Koontz… and those are two who sell well. If you are from Mississippi, then using a British voice will fail. I think writers have to have honesty about them or it doesn’t work. I write what I like and know. If I tried to write British mysteries, I would be writing outside my voice and would be dishonest to my readers and that, to me, is wrong. Formula writing is easier… yes… and it sells… wow… does it ever sell… but… is it satisfying? I have no ideas because I refuse to write formula novels. Don’t write what you want or what a reader wants… write what is fair. Write what is real. Should a main character die? If it is fair… I think I am a Stephen King fan because he may make me mad or sad… whatever… but he is always fair in his writing. What happens in his stories is always realistic and if I am bummed out at the end, so be it… it had ended fairly. I think Hitchcock did that well too. Sometimes the good guy doesn’t win. Morgen: I agree about the voices. Films especially when they get the British wrong are so maddening. Just find a real Brit and they’d get it right. And I love it when the good guy doesn’t win – again it’s down the predictability. If you could invite three people from any era to dinner, who would you choose and what would you cook (or hide the takeaway containers)? catt: Marco Polo (He said he didn’t tell half of what he saw and did and I want to know), Judas (I want to know his motivations and feelings and would have a million questions for him), Benjamin Spooner Briggs (He was the captain of the Mary Celeste that they found abandoned in the Bermuda triangle). I would serve my salsa and chips with plenty of Mexican beer. Morgen: My Mexican lodger (housemate) would love that! Is there a word, phrase or quote you like? catt: I hear people always say they would be writers if they had the time and I always say, I would be a brain surgeon if I had the time. (dripping with sarcasm) That somehow sets me a blaze. It implies that everyone can just sit down and write a book…like everyone can open his mouth and sing opera? No. An idea and a thesaurus do not a book make. I research, I have plots and stories, I develop characters, I have messages and sub plots. Writing isn’t easy. It isn’t something I CHOSE; it is just what I can do well and so I do it. It’s a JOB. Morgen: It’s all too easy to let ‘life’ take over but it’s amazing that we can find the time when we have to. Give me a deadline and I (usually) stick to it, like NaNoWriMo. I always find time in November (or have done since 2008) to write 50,000 words. What do you do when you’re not writing? Morgen: 🙂 Where can we find out about you and your writing? Morgen: Thank you very much, catt. 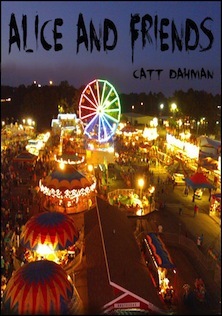 catt dahman has been writing for more than 30 years, has taught in public schools, private schools, Home school, and college (literature). Her B.S. and M.S. degrees are from Texas A & M., with almost a doctorate in psychology (criminology). She has a Texas teaching certificate A native of North East Texas, she has lived all over the US, (and tries to claim Jamaica as a second home) but is currently back in the Fort Worth, Texas area where she lives with her husband, David (a retired Marine), son Nic, 4 cats (Ollie, Limmy, TS and Murron), a ferret (Tassels), and dog (Levi). Family and writing are her life. First published in the 80s, she now is a full time writer with a mission to scare everyone she can find. She has also been a public speaker, artist (numerous awards and art shows), director for a charity (YWCA), dabbled as a PI, and more. When not working, she enjoys SCUBA diving (certified PADI), reading, collecting Tarot card sets, playing Legos with her son, and growing herbs. She now writes full time, working on A zombie series of four books, short stories, horror, thrillers, suspense, and westerns. In Northeast Texas, the epic adventure of a group of survivors begins as they take refuge in a hospital, waiting to see if the world-wide Red Infection can be stopped before all humanity is wiped out. As victims awaken from a coma, they now have the basic need to attack loved ones, to spread the infection, and to feed on warm flesh. Only rage remains. In days, the dead outnumber the living, and the US turns to the ultimate weapons to stop the infection. In a world filled with zombies, survivors find that the living can be far more inhumane and cruel than anything they have ever imagined, as raiders scavenge for supplies and lawlessness and hatred are the norm. Both outlaws and zombies crave meat. In this time of hopelessness and horror, a bullet to the brain may be the kindest action. George, an older, retired police officer, sets his own terms: fight and survive or go the way you want, but don’t let the zombies win. He explains that everyone is responsible for his own fate, and if that means going out on unpopular terms, then so be it. Len, a retired Marine; a quiet cowboy, Kim; a hot-tempered Hispanic woman, Julia; and a compassionate young woman, Beth all begin their terrorizing journey, not only to survive, but also to establish a new society, find love and joy in a barren, bloody landscape, and to face gathering enemies. 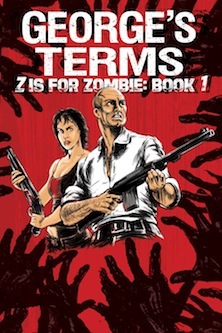 The first of the compelling series, George’s Terms, introduces a memorable cast of characters and a terrifying vision of a world, burned to rubble and filled with flesh-eating adversaries. As each person faces inner fears and new roles, he finds law and morality must be redefined. Zombies are used as the vehicle, but the story is all about what humans will do to survive when the odds are stacked against them; luckily, for the survivors, George has given them the terms that may keep humans from becoming extinct. She has also released three indie titles; ‘Alice and Friends’, ‘Smooth, and ‘Time of Grace’ (see covers below), available from http://www.amazon.com/-/e/B007N5843K. Further details from her website, www.cattd.com.